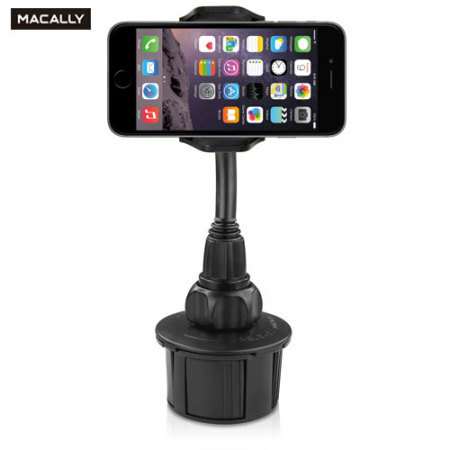 Keep your phone close at hand and safely in view while driving with the Macally adjustable cup holder mount. Other then wanting to know the diameter of the base that goes into the cup holder (a perfect fit as it happens) the universal phone cup holder mount is exactly what I wanted and does not look out of place in the console of my car. I am able to see the screen of my iPhone when using maps or receiving phone call. The only problem isn't with this device, which is a good idea and well made, but with my cup holders! They are not a complete circle and a bit too close to the dashboard overhang so it's a bit of a squeeze and not as stable as I'd like. But that's a problem with my MiTo, not the product, so still 5 stars. Was on back order, but worth the wait! This product is a handy cell phone holders and it fits must cup holders and securely holds most popular phones. Fits my car cup holder as per web site mentioned, so very handy. Could have had a longer arm but it is good as is. this product can rotate in almost any direction and is stable within cup holder. Really nice product. I like it because it is not in your way while you are driving. I have quite a short lightning cable to charge my iPhone and hence I needed a car phone holder that was quite low down in the car. This holder sits in my Mini Cooper drinks holder perfectly and is the correct height although it works better in the passenger cup holder as opposed to the drivers cup holder. It fits my iPhone 5 well but could potentially fit any phone and has a great release button at the back to easily release the clasp of the phone. Really happy with the product and the kit actually looks like it's part of the actual car itself. Good quality and not tacky and cheap looking. The Macally cup mount holder works well and has a niffty button press to release the phone. However it was not the one I ordered. I ordered the short stem version as per the website picture, but was sent the XL version with longer neck. As I am not well I could not return it. Disappointed. I'm sick and tired of phone holders that fall off dashboards, refuse to stay stuck to windscreens or glass and those that simply don't work at all. This piece of kit does exactly what it's supposed to although you may find that cup holders in some vehicles are not in the best viewing position. For my Fiesta it's just perfect sitting behind the handbrake lever. Needed a phone holder for my mini cooper that was quick and easy to fit but which didnt sit on dash or windscreen as can obstruct view. This firs the bill perfectly and because of flexible neck and seating in cup holder can get a good position without obscuring switches and gear stick. Would recommend and as always delivery was quick. Have a mini & fits perfecting into the cup holder as minis arnt the greatest design for mobile phone holding. Useful & good value compared to other similar products on the market. Received product in a timely manner. Works great with my Iphone 6 Plus. This is a great way to hold your phone, player or satnav away from the windscreen. Solid, secure and device-friendly. Great company to deal with too. I use this in my Jeep Wrangler - it fits really well in the console cup holder and hasn't come loose yet - build quality is excellent and it fits my Lumia 950 XL perfect as it doesn't hit any buttons on the side of the phone. I especially like the gooseneck which allows me to turn the phone anyway I want. I recommend this to any Lumia 950 XL owners. Works really well but can break easily if care is not taken when tightening. This item is excellent quality, holds the phone very well and has an excellent flexible arm for ease of adjustment. However, beware... My Ford Mondeo has duel cup holders that are joined via a smaller but significant gap. This gap does not allow the expanding arms on the phone mount to be tightened evenly all around to grip properly, causing it to work loose under use. I am experimenting by using a soft plastic cup installed first to make a complete circle for the holder to grip. So far part successful! Great piece of kit, my problem is with the holders, not the manufacturer, hence four stars. Item was nice and sturdy just as advertised. Item was nice and sturdy just as advertised. Would recommend. Brilliant. It deserves 11 out of 10. Cant get much better than that.